I am almost embarrassed to share this recipe with you…almost. 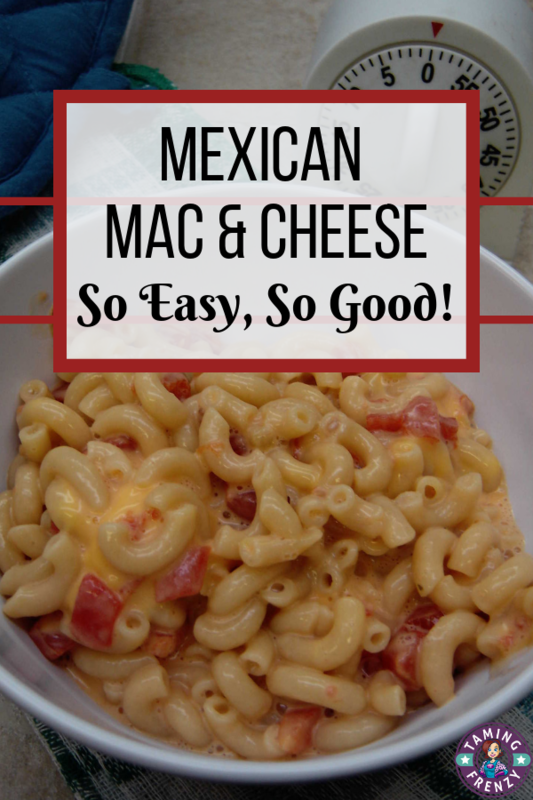 This recipe for Mexican Macaroni and Cheese is so simple and easy that it might be one of the first recipes you decided to teach the budding cook in your life to make. That also makes it perfect to help the busy woman get dinner on the table quickly at the end of the day. We love pasta at out house. We also happen to love cheese. In fact, when I married Jungle Jim he was stunned at how much my family loves cheese – it’s in nearly every recipe I knew how to make. And no matter what your skill level in the kitchen, this dish always turns out great. Bring water to a boil and cook macaroni according to directions. When macaroni is at desired tenderness, drain water. Do NOT rinse macaroni in cold water. Put hot macaroni back in pot and add cubed cheese. Stir to begin melting cheese in the hot macaroni then add milk and heat over very low heat. Stir continuously to prevent sticking. When cheese is melted through add Rotel and mix thoroughly. I frequently double this recipe. My family loves mac and cheese and I like to cook once and have some leftovers for the next meal. I sometimes add an additional can of diced green chilies (not Rotel) to the mixture to turn up the “oomph” factor. If you tend to like your food with a little more heat, Hatch green chilies or even diced jalapenos would be a good addition. There are even times when I add cooked hamburger or shredded chicken to the recipe when I want to serve it as an entree instead of a side dish. No matter what you choose to add, this recipe is still quick and easy – just what the busy woman needs at the end of the day! If you like this recipe please share it with your friends on Facebook or pin it to your favorite Pinterest board. And I’d love to have you sign up for the weekly email. You’ll get links to posts, exclusive content and other information not found on the site. Is there a dish that your family loves that’s so easy you’re almost embarrassed to share it? Hi Janice. Yours is one of my favorite parties. Even on weeks when I am super busy, yours is written on my calendar. Besides, I always click over on your site to spend some time learning about the business of blogging. I’ve learned tons from you! My kids are mac and cheese fanatics and of course I love it because it matches my kitchen skill level perfectly (non-existent). This is a nice way to change things up a bit when Mom is responsible for dinner . . . thank goodness my Mr. Hobby can cook 🙂 Pinning to share! Hi Laurie! Mac & Cheese is one of my all-time favorites – I’m a pasta girl from way back! Isn’t it great to have a hubby who cooks? At our house, Jugle Jim is really the gourmet and I’m the planner. Yum..I put salsa on nearly everything! That would be a great addition. Thanks for stopping by.